In FogFlow a service topology is defined as a graph of several operators. Each operator in the service topology is annotated with its inputs and outputs, which indicate their dependency to the other tasks in the same topology. Different from fog functions, a service topology is triggerred on demand by a customized “requirement” object. With a simple example we explain how developers can define and test a service topology in the following section. 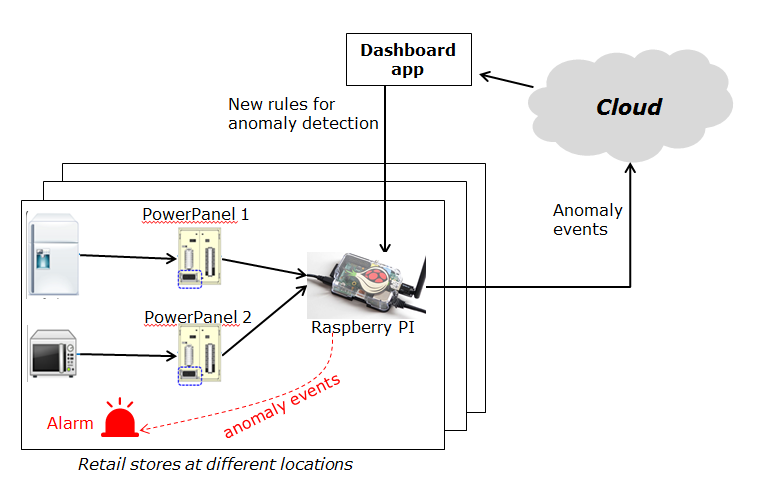 This use case study is for retail stores to detect abnormal energy consumption in real-time. As illustrated in the following picture, a retail company has a large number of shops distributed in different locations. For each shop, a Raspberry Pi device (edge node) is deployed to monitor the power consumption from all PowerPanels in the shop. Once an abnormal power usage is detected on the edge, the alarm mechanism in the shop is triggered to inform the shop owner. Moreover, the detected event is reported to the cloud for information aggregation. The aggregated information is then presented to the system operator via a dashboard service. In addition, the system operator can dynamically update the rule for anomaly detection. Counter: this operator is to count the total number of anomaly events for all shops in each city. Therefore, its task granularity is by city. Its input stream type is the output stream type of the previous operator (Anomaly Detector). There are two types of result consumers: (1) a dashboard service in the cloud, which subscribes to the final aggregation results generated by the counter operator for the global scope; (2) the alarm in each shop, which subscribes to the anomaly events generated by the Anomaly Detector task on the local edge node in the retail store. Before you can define the designed service topology, all operators used in your service topology must be provided by you or the other provider in the FogFlow system. 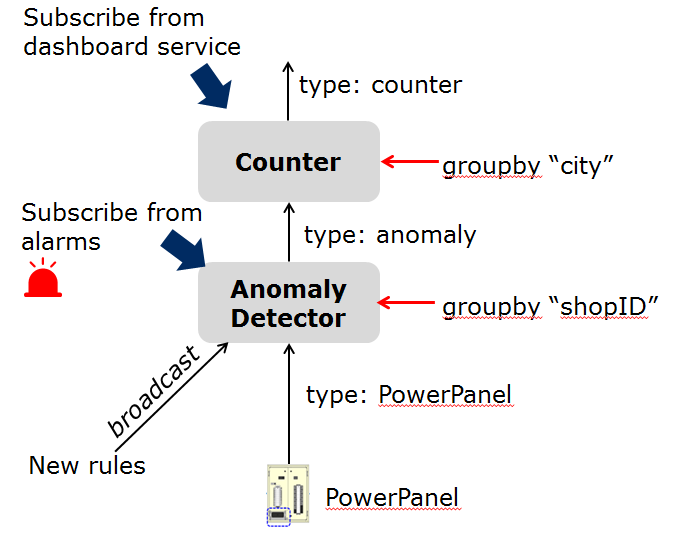 For this specific use case, we need to implement two operators: anomaly_detector and counter. Please refer to the examples provided in our code repository. For each operator, once we create its docker image and push it to the FogFlow docker registry, we must register the operator in FogFlow. This can be done in one of the following two ways. Please notice that each operator must have a unique name but the same operator can be associated with multiple docker images, each of which is for one specific hardware or operating system but for implementing the same data processing logic. During the runtime, FogFlow will select a proper docker image to run a scheduled task on an edge node, based on the execution environment of the edge node. The following picture shows the list of all registered operator docker images and the key information of each image. After clicking the “register” button, you can see a form as below. Please fill out the required information and click the “register” button to finish the registration. The form is explained as the following. Prefetched: if this is checked, that means all edge nodes will start to fetch this docker image in advance; otherwise, the operator docker image is fetched on demand, only when edge nodes need to run a scheduled task associated with this operator. Please notice that the name of your docker image must be consistent with the one you publish to Docker Hub. By default, FogFlow will fetch the required docker images from Docker Hub using the name you register here for your operator. Assume that the tasks to be used in your service topology have been implemented and registered, you can have two ways to specify your service topology. The first way is to use the FogFlow editor to specify a service topology. As seen in the picture, the following important information must be provided. With a right click at some place of the design board, you will see a memu pops up and then you can start to choose either task or input streams to define your data processing flows according to the design you had in mind. As shown in the following picture, you can start to specify the profile of each task in the data processing flow by clicking the configuration button. The following information is required to specify a task profile. Another way is to register a service topology by sending a constructed NGSI update message to the IoT Broker deployed in the cloud. Please notice that the input data for the leaf nodes of your service topology must be already reported by your IoT devices. It works like this in the current version, but this requirement will be no longer needed in the new version.